Isaac has been in the army; the weight of the war is still in his body, causing him to stoop, to not look people in the eye, to vomit. He’s returned home, hoping to be embraced by his parents and his sister. But his family has changed; this comfortable home is now a mess of clothes on the floor and dirty dishes, empty cupboards and piled up furniture. This is not the reunion Isaac was looking for. Father Arnold has had a stroke and mother Paige is feeding him a cocktail of pills to keep him docile. He’s on estrogen and made-up like a clown. Max, who was once Maxine, now identifies as transgender and insists on the pronouns of “ze” and “hir”. The “hir” and “here” homophone is key to Paige’s many rants throughout the play; with all this brand-new information at her fingertips, she’s ready to change the world. And she’s starting with upending the patriarchal structure of the family home. Taylor Mac is a performance artist whose most recent work in Australia was headlining the Melbourne Festival with his twenty-four-hour show, A 24-Decade History of Popular Music. judy’s queer sensibilities radically reimagined music and musicals from across America’s two centuries. The play Hir echoes one of Paige’s pronouncements about not messing with form and content at the same time; much of the structure of this family drama is quite traditional. If not for the central LGBT content, the form of the story feels not unlike a kitchen-sink drama that might be staged at the Melbourne Theatre Company. But the passages that feel like they could be teaching the audience abut a troubling messiness in the characters themselves. Paige and Max are trying to forge a new hir-story without really knowing what they are going to replace the patriarchy with. Paige insists on homeschooling Max, leading to lots of knitted craft on the walls and banjo playing, but leaves hir with no greater ambition than living in a commune. 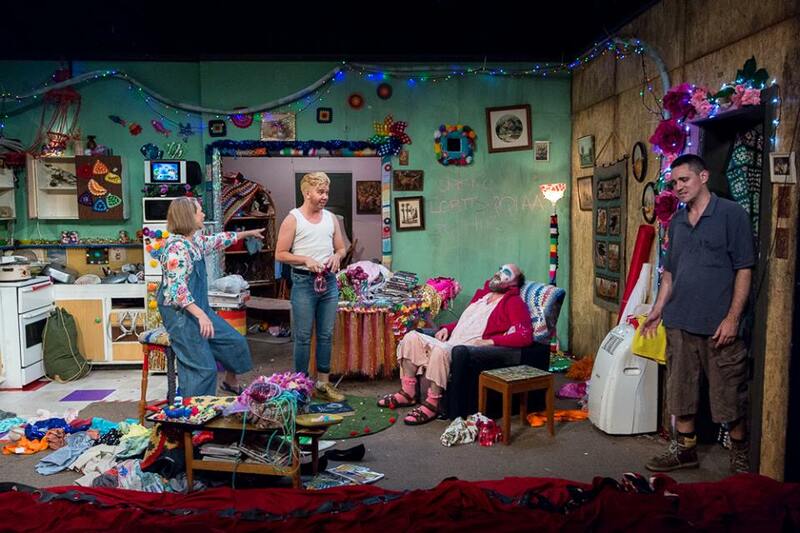 Director Daniel Clarke has brought together a hell of a creative team to populate the tiny Red Stitch stage with a messy set and complicated characters. For a story that threatens to spiral out of control at any moment, he has a clear vision of what he wants, allowing us insight into the characters amidst the kaleidoscopic chaos. As Paige, Belinda McClory is her usual powerhouse dialled up to eleven, twelve and beyond. What was Paige like before Arnold’s stroke? There are hints, but what’s in that place now is incomprehensible to Isaac and a force of nature to Max, who sometimes feels as much of a victim of Paige’s newfound beliefs as ze was under hir father’s roof. Harvey Zaska-Zielinski’s Max is a headstrong teenager given the ultimate power by hir mother to be themselves. His performance is remarkably complicated; shifting between excited at previously unknown freedoms and occasionally scared Max won’t live up to Paige’s expectations. Ben Grant’s Arnold is mostly subdued and monosyllabic but he brings a vulnerability to his character that he shares with his just-returned son Isaac; they feel powerless in this new regime. 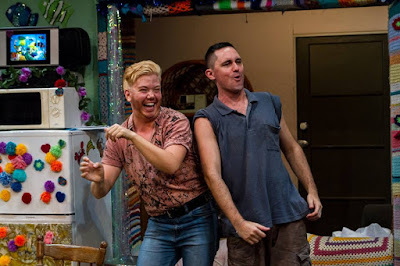 And Taylor Mac’s play is at pains to be clear that tearing down society’s structures might be problematic if you have no true sense of what to replace that with. If everyone is everything, what does that mean? 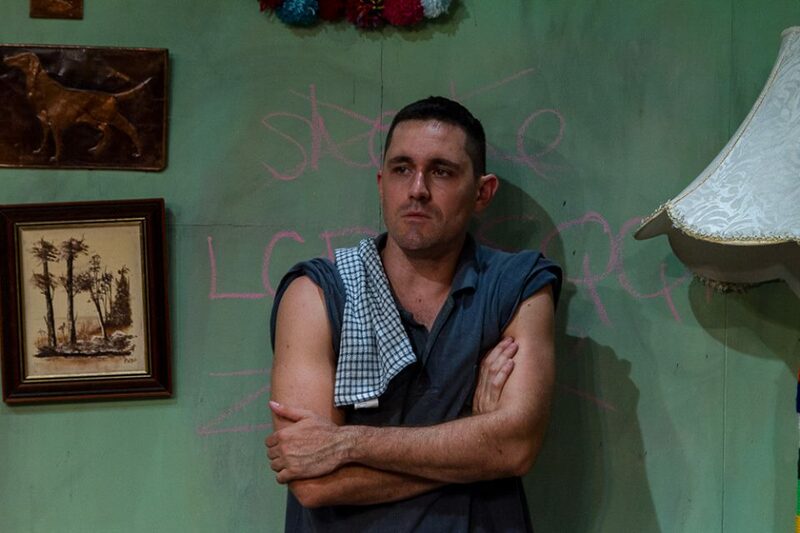 As the literal and figurative straight man, Jordan Fraser-Trumble’s Isaac is withdrawn and stilted, his PTSD ready to explode out of him at any moment. Early on, Fraser-Trumble’s work seemed hesitant but then it became clear that was key to Isaac, the weight of history is on his shoulders; he is all men. His work here is amazing. Hir is as thrilling and challenging a work as I have ever seen on stage. Its set up is simple and its premise is clear. But while it moves in ways you might expect in a family drama, the endeavour drives toward questions that are difficult to grapple with and answers to which are almost impossible to form. Taylor Mac’s Hir is a stunning opening to Red Stitch’s 2018 season. It runs until March 4th.